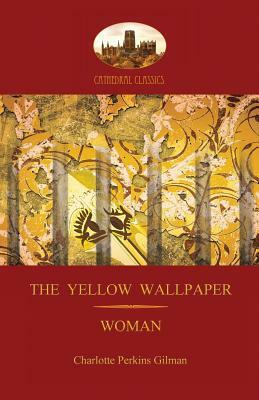 'The Yellow Wallpaper' is a semi-autobiographical short story drawing on Charlotte Gilman's personal experience of mental collapse, exacerbated by the paternalistic attitudes current in her day, a tale which doubles as the perfect vehicle for protesting the unequal status of women in marriage. In 1886, after the birth of her daughter, Gilman was struck with severe post-natal depression. Medical opinion at the time ascribed this condition to too much mental activity for the female mind, and she was prescribed a "rest cure." For an intellectual like Gilman, such forced inactivity was a disaster, and a full nervous breakdown ensued. In 'The Yellow Wallpaper' a young woman tells of a similar enforced idleness, and we watch with horrified fascination her slow descent into madness. Suffering from depression, she is forced to 'rest' in a barred room, where her agitated mind becomes obsessed by the room's yellow wallpaper, upon whose chaotic swirls she seeks to impose order and pattern. Gradually, the image of a stooping, creeping woman appears - held captive by the 'bars' of the main pattern - a potent symbol for the stultifying effects of both her personal life and society at large. Eventually, deeply unstable, she sees trapped, creeping women everywhere, and knows herself to be quite as confined as any within the yellow wallpaper. Although known now for her prose, Charlotte Gilman first rose to prominence through the excellence of her verse. 'Woman' - the central section of Gilman's highly acclaimed 'In this World' - comprises twenty-nine poems that expand upon the theme of female emancipation and cover a wide range of topics - from female suffrage through marriage and motherhood, to male vanity and willing female submission. Widely regarded in its day, 'Woman' has continued to be a source of inspiration for many modern-day feminists.